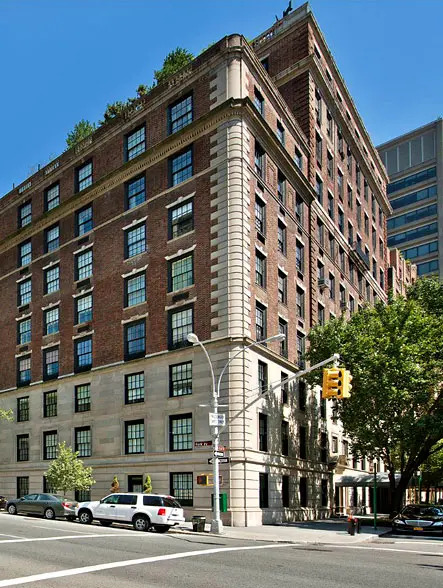 A very handsome, mid-rise, pre-war building with an elevator operator and large apartments and a substantial garden on Park Avenue. The red-brick building has a three-stone rusticated limestone base and limestone quoins and a canopied entrance across 67th Street from the Seventh Regiment Armory. The building is across 68th Street from Hunter College and there is a Lexington Avenue subway station at 68th Street. The building has consistent multi-paned windows and some discrete air-conditioners. There is a string course above the 6th floor and a bandcourse above the 7th floor. The south wing is 8-stories and the north wing is 7 stories. The large garden in the center of the building’s frontage on the avenue has a high fence with limestone stanchions. There is no sidewalk landscaping. The building has a doorman and an elevator operator and wood-burning fireplaces. It is also pet friendly. Apartment 4A is a three-bedroom unit with a 15-foot-wide entry foyer that leads to a 19-foot-long library, a 24-foot-long living room with wood-burning fireplace, and a 19-foot-long enclosed dining room next to a 17-foot-long pantry that leads to a 16-foot-long kitchen. The apartment also has two staff rooms. Apartment 7E is a three-bedroom unit with a 15-foot-wide entry foyer that leads to gallery that opens onto the 20-foot-long library and the 27-foot-wide living room with wood-burning fireplace next to the enclosed 20-foot-long dining room next to the 10-foot-long staff room and 16-foot-long kitchen. Apartment 8C is a one-bedroom unit that has an 11-foot-long entry foyer that leads to a 16-foot-long gallery that opens onto a 27-foot-long living/dining room with a wood-burning fireplace that leads to a 14-foot-square library, a 9-foot-staff room and a 20-foot-long kitchen. Apartment B on the 8th and 9th floors is a duplex with a 19-foot-long entrance gallery on the lower floor that leads to a 25-foot-long living room with a 10-foot-square solarium entrance to a 73-foot-long terrace and is adjacent to an 18-foot-long library with a large bay window on the terrace and is next to an 18-foot-long den. The lower level also has a 23-foot-long dining room across from a 16-foot-long enclosed kitchen and two bedrooms. The upper level has a 24-foot-long entertainment room, a 14-foot-long gym, a 14-foot-long laundry, a 10-foot-long staff room, a 15-foot-long kitchenette, a 20-foot-long study, a 10-foot-long office, and three bedrooms. Harold I. Pratt, Percy Pyne, William Sloane and Arthur Curtiss James, home-owners on the west side of Park Avenue between 68th and 69th Streets, bought this site from Hahneman Hospital in 1919 and planned a 7-story building with 12 triplex apartments designed by Delano & Aldrich, the architects who had designed the townhouse of Mr. Pratt, a founder of Standard Oil, on the southwest corner of Park Avenue and 68th Street. Unfortunately, there were no takers for the triplexes and the would-be developers resold the property in 1923 with significant height and façade restrictions in an attempt to retain their “light and air” and prevent tall buildings across the avenue from casting shadows on them. He recounts that although great apartment houses are now treasured landmarks, "In 1919, however, many Upper East Siders looked upon the proliferating multiple dwellings merely as casters of long shadows and intruders upon an otherwise gracious neighborhood of private residences. So great was the perceived threat, in fact, that a group of the area's property owners banded together to prevent the development site at Park Avenue and East 67th Street from being 'improved' with yet another bourgeois behemoth of a towering tenement. “The impetus for this circling of the gilded wagons was Hahnemann Hospital's need for more space....The hospital had been in the forefront of the homeopathic medical movement of the nineteenth century and had prospered, along with the nearby Presbyterian Hospital at East 70th Street and Lenox Hill Hospital (originally the German Hospital) at East 77th Street and Park Avenue....Needing larger quarters, it acquired an essentially vacant 30,000-square-foot site at East 106th Street and Fifth Avenue. “In 1919, it simultaneously began construction of a new building and put its Park Avenue property up for sale. 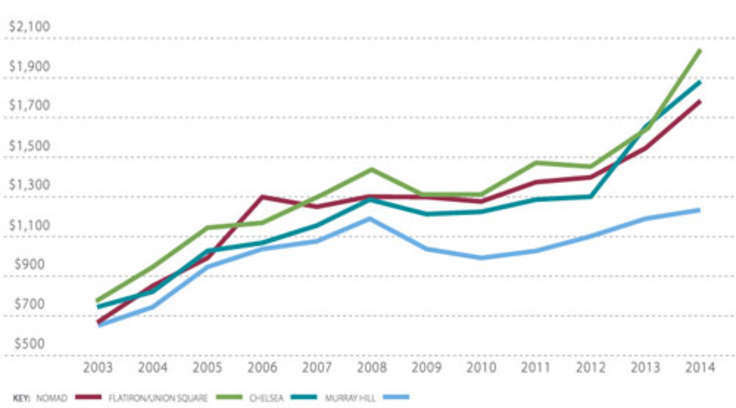 In reaction to this move, under the aegis of Douglas Elliman a syndicate was formed by owners of nearby mansions. Percy Pyne, William Sloane, George Blumenthal, Arthur Curtis James, Harold Pratt and several others purchased the hospital site in joint venture and attempted to find similarly prosperous people who might be willing to construct private houses on the site. “By January of...., however, it was obvious that even this compromise mansion/apartment plan was not viable, and the neighborhood syndicate sold the then-vacant property to Dwight P. Robinson & Company for multifamily cooperative occupancy. Nonetheless, the protective sellers retained the last word by imposing height restrictions that effectively barred the construction of yet another of the 15-story apartment houses that they considered to be so objectionable." “As finally built in 1924, 655 contained about 50 apartments. The projecting bays on the avenue are 8 and 7 stories tall at 67th and 68th Streets, respectively, because of the avenue's hill at this location and rest of the building, to the east, is three stories taller. “William K. Vanderbilt Jr., bought one of the maisonettes and other early residents included Isaac Newton Phelps Stokes, the author of "The Iconography of New York," a 7-volume book on the history of the city, Congressman Hamilton Fish, and Carman H. Messmore of Knoedler's, the art gallery. Several of the syndicate's mansions have survived across the avenue, all now official landmarks.